Kenda Kwest, 26" x 1.95"
The Raleigh Sprite iE is a perfect electric bike for someone who is willing to pay a little extra for reliability, a great warranty, and easier maintenance… but still, wants good value. 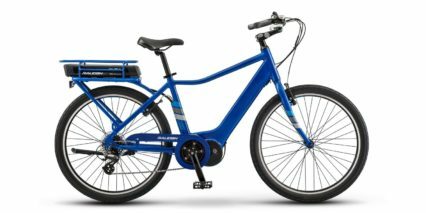 The bike comes in two flavors (high-step and step-thru), four frame size options, and offers paint matched fanders, rear rack, and rigid alloy fork. 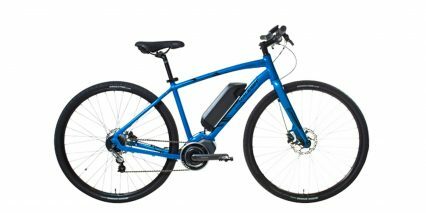 Its slightly fatter tires, medium-wider saddle, swept-back bars, and adjustable stem, really let you dial in a comfortable or active body position. I was impressed with the display panel because of how simple it was to use at first but then later, how many options it offered for advanced users… like a 5-volt Mini-USB port to charge your phone or other portable electronic device, and the range menu readout. Considering how compact the LED display unit is, it worked very well and had the benefit of not being distracting or feeling delicate. 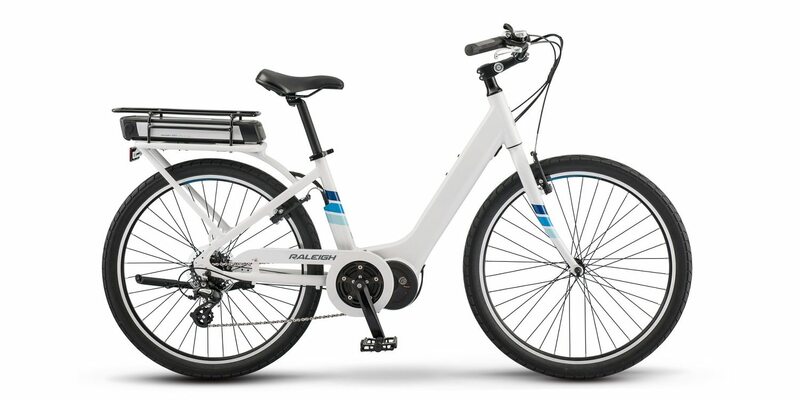 You usually want the weight of a bicycle to be low and center if possible, but I can see why Raleigh opted for a rear-rack battery because it allows for a really nice step-thru frame… and this way, both battery packs are interchangeable and thus, less expensive. 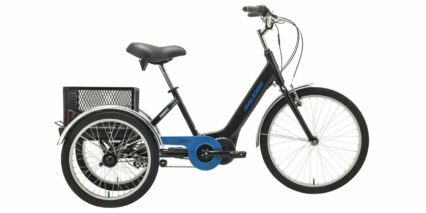 This is an electric bicycle that I could see older adults and seniors enjoying. 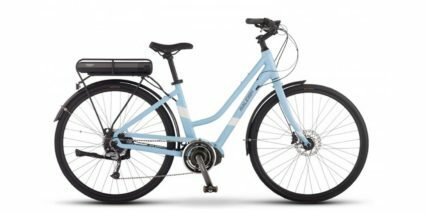 It’s not especially fast, keeps you lower to the ground because of its 26″ wheels vs. 28″ on many other city bikes, and it’s just simple and beautiful. 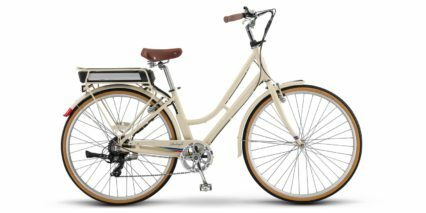 The kickstand is well placed, the ergonomic grips feel good, the linear-pull brakes are reminiscent of classic bicycles, the likes of which Raleigh has been manufacturing since 1885. This is one of the oldest bicycle companies in the world after all. 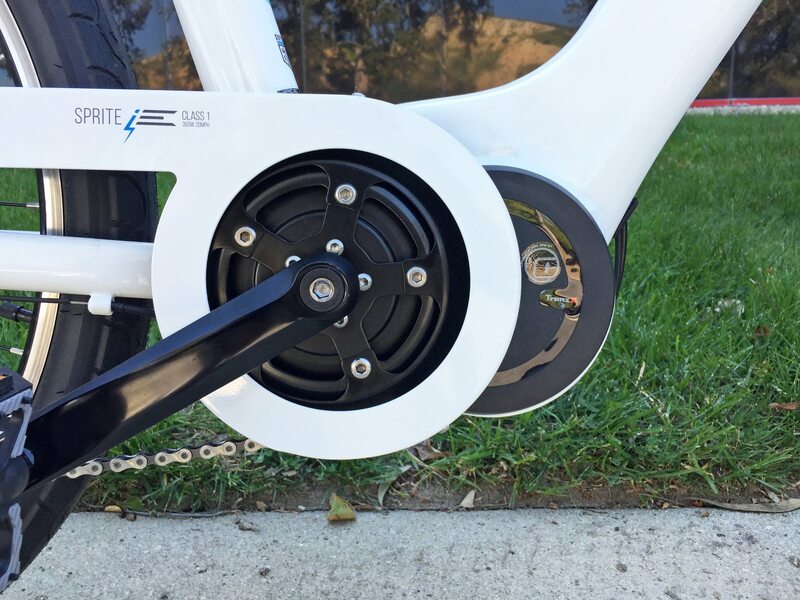 Driving the 2017 Sprite iE is a 350 watt nominally rated TranzX M16 mid-motor. It’s compact, efficient, and impressively powerful if you click up to the highest levels of assist. 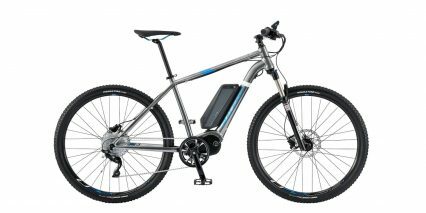 The peak power output is 500 watts and your peak torque rating is 68 Newton meters. 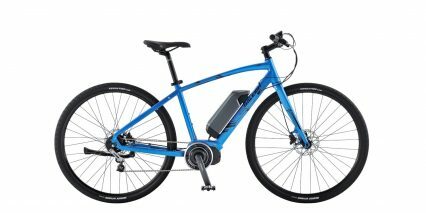 This thing will have no problem powering you up hills as long as you switch down to a lower gear and just keep on pedaling. 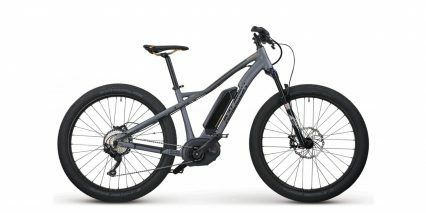 Unlike some other e-bikes, this motor only cares that you’re moving the cranks, not that you’re pushing especially hard. 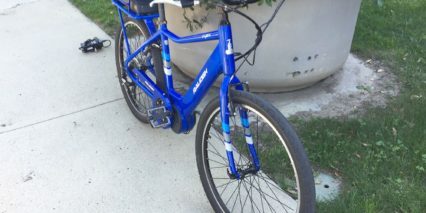 It relies on a cadence sensor, so you do have to get the bike rolling a little bit before it knows to kick in. And this is one of the drawbacks about the ride experience. 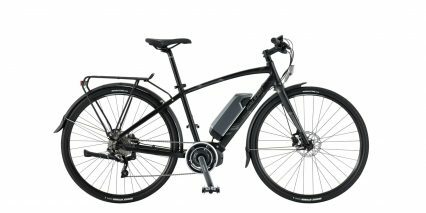 Raleigh offers a boost button that can be used as a throttle, but you still have to get the bike rolling before that button will activate. 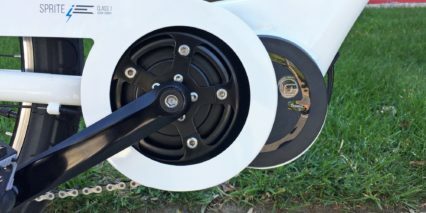 It’s a $50 add-on accessory and in my opinion, misses the point of a throttle which is to help you get moving after a stop sign or when preparing to climb a hill from a standstill. The optional throttle may be tricky to mount close enough to one of the grips to actually use comfortably while holding on and steering (compared to a twist-throttle) and could push your shifter our the display panel or brake levers out further if you prioritize its positioning. 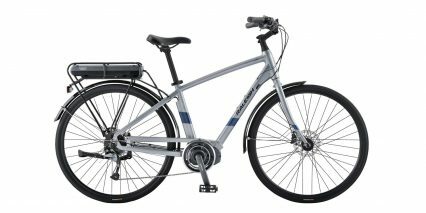 I was impressed with ow well the old-fashioned brakes on this bike worked but they aren’t as comfortable to use as the new hydraulic disc brakes. 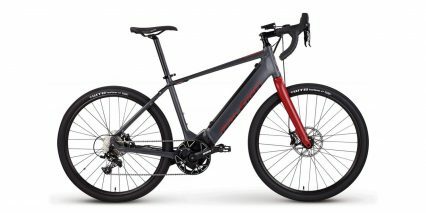 They’re just less expensive, much like the low-level Shimano Altus 7-speed drivetrain. 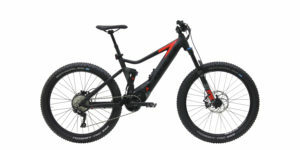 It gets the job done but the shifter mechanism is bulky and the parts might not shift as quickly or work for extended months of riding without a tune-up the way that higher end kit would. Again, this is neighborhood level hardware. 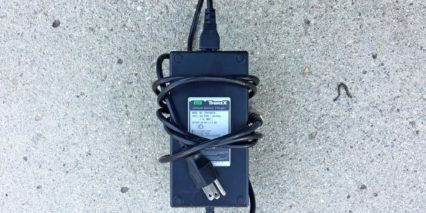 Powering the motor and any lights that you have wired-in, is a 48 volt 8.8 amp hour battery pack that I’d call slightly above average in terms of capacity. 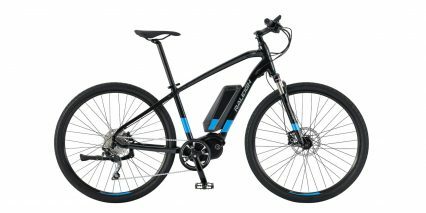 The real highlight is that it runs at a more efficient 48 volts and can send higher amps to the drive system for that 500-watt peak output. 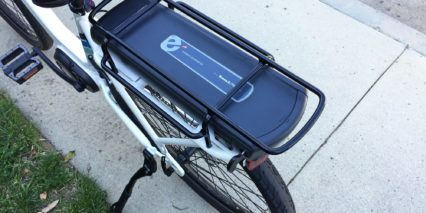 The pack is a big plastic rectangle that slides into the rear rack, where it is protected and can be charged on or off the bike. 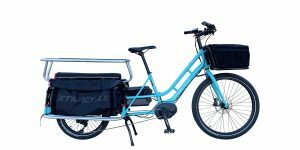 I almost always take battery packs off of my e-bikes when lifting them onto racks, carrying them up stairs, or storing the bike in a hot or cold environment. To really care for your battery, it’s best to store it in a cool, dry location and check on it every couple of months if you haven’t used it. 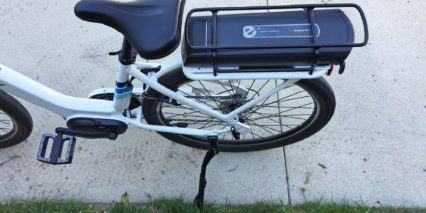 Most electric bike batteries come charged at ~50% to avoid stressing the cells at the high or low ends. 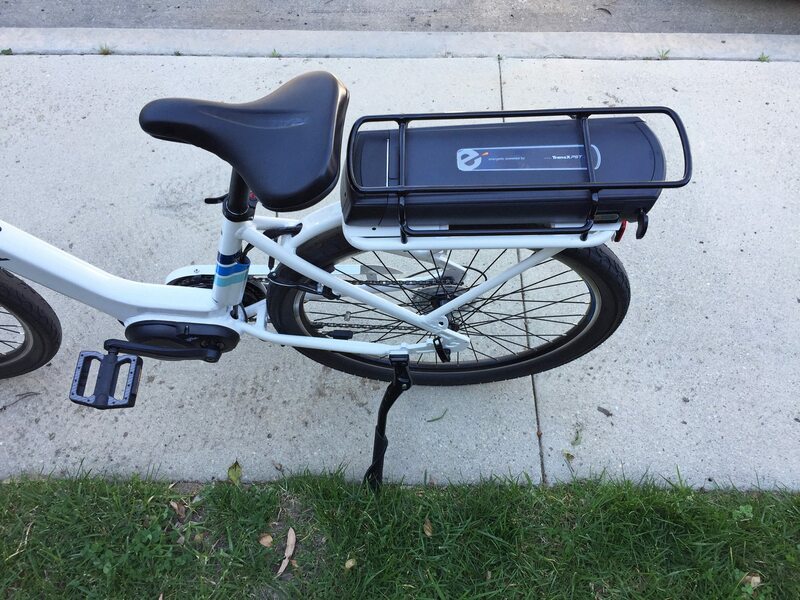 This battery weighs ~7.4 lbs which puts it on the heavy side for its capacity, so perhaps the cell type is more basic (lower energy density) and that keeps the price down. 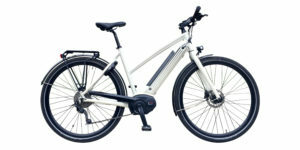 The chemistry is Lithium-ion which is appreciated for its durability properties. 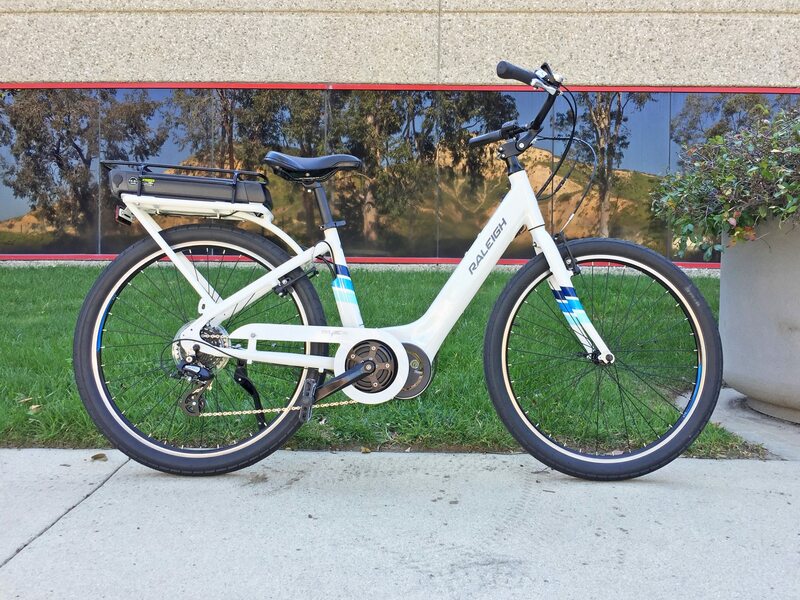 They don’t tend to develop a memory if you forget to charge them up and they usually last 1,000+ cycles before dropping off in power storage. So this is part of why Raleigh can offer such a good warranty. I like that the battery pack has a swivel handle at the back so you can pull it off and carry it more securely… but I dislike that the battery has its own power button in addition to a power button on the display. It requires extra foresight and time to press two power buttons and if you forget, you might have to get off the bike or twist and stretch backward. 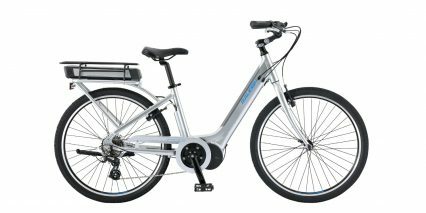 Once you switch the bike on, all you really have to worry about is pressing a plus or minus button for more or less powerful motor support. The control pad is within reach of your left hand and can be clicked without removing your hand while steering. It’s small, black, and rubberized for comfort and protection against the elements. At the top, there’s a three-color LED readout that communicates charge level. This isn’t very precise and I’d gripe about it more if it weren’t for the cool range estimator feature. To use this, just arrow up into any one of the four levels of assist (shown as green bars) and then tap the power button on the control pad. This will momentarily change the speed readout to a range estimate. Another little secret is walk mode, which can be activated by holding the plus button until a green light appears at the top of the disply, and then holding the minus button down. 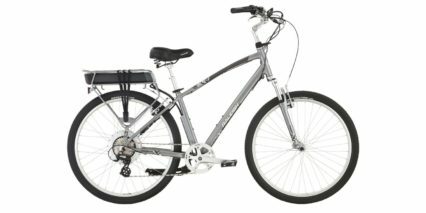 Walk-mode comes in handy when walking with friends in crowded areas, up hills, or if the rear rack has a bag loaded up with gear. 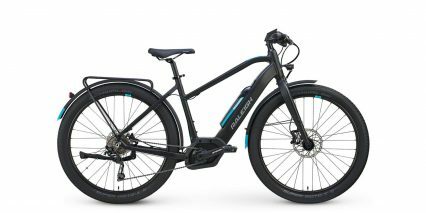 Remember, this e-bike weighs 54.2 lbs with the battery on. 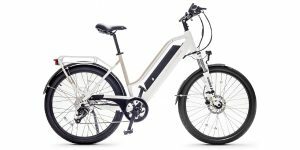 At the end of the day, I feel like the Sprite iE offers a good experience in terms of balance, frame size options, beauty, durability, and value. 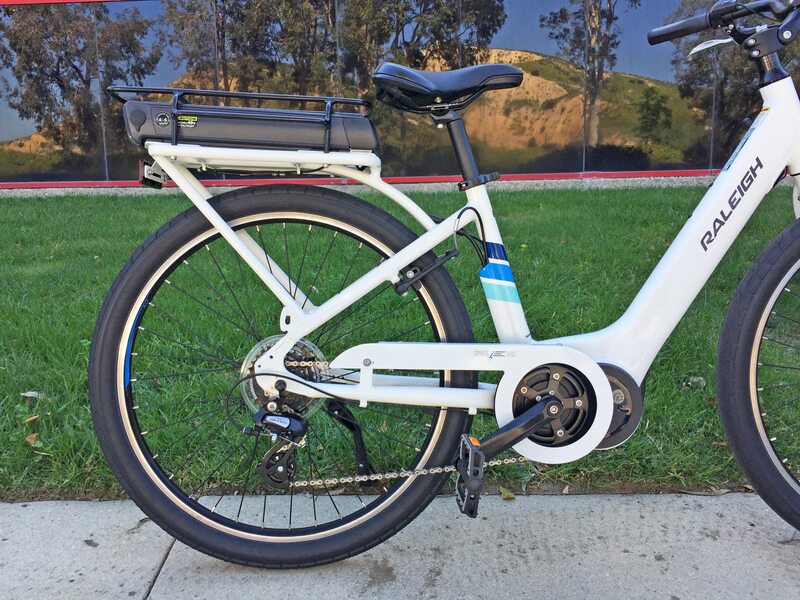 I can pick on the cheaper drivetrain but seven gears is plenty for the max assisted speed of 20 mph and the larger shifter pad might be less intimidating for new riders or those with limited vision. It certainly works well if you’re wearing gloves because it’s so large. The brakes work just as well as any of the brakes you might have used since the 90’s and even though they don’t have motor inhibitors built in, I feel like the motor is quick enough and the top speed is low enough that this isn’t a deal killer. 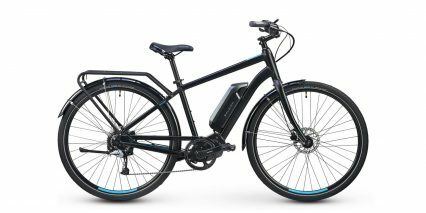 I love that Raleigh pre-wired the bike for lights so that you could work with your local ebike shop to enhance the safety in a more permanent way than just clipping on aftermarket lights (which can accidentally be left on or stolen) but I do not understand or really appreciate the optional boost button. It’s just not that useful or comfortable to use, I feel like they nerfed it in the name of safety but ironically took out the motor inhibitor brake levers. 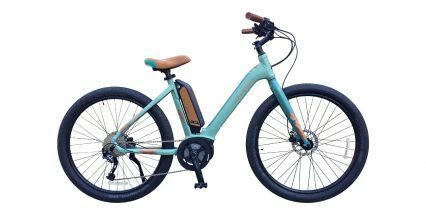 As a Class 1 pedal assist only electric bike (without the boost button) the Sprite iE will be allowed on more trails and perform more like a traditional human-powered bicycle. 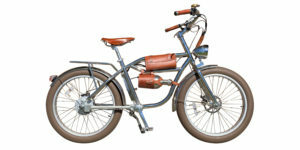 You can even turn the pedal assist system off and ride it the old fashioned way. 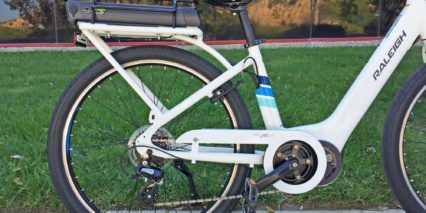 I really appreciate the chain guide to reduce chain drops and drivetrain issues and felt comfortable with the large plastic pedals. 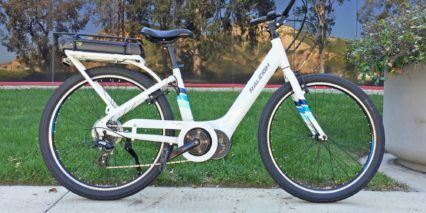 I want to thank Raleigh Electric for inviting me out to their headquarters for a test ride on this bike and partnering with me on this review because I got to see both models side by side. 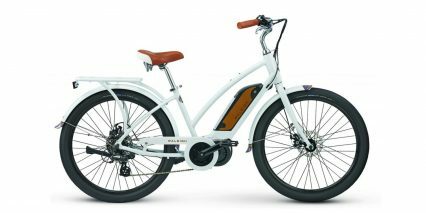 They look great and could be a great option for a wide range of riders looking for value. 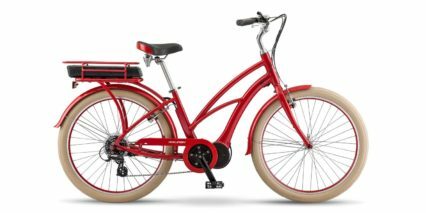 Hi, I just bought the step through model of this bike and I really do love it. One thing I have noticed though. 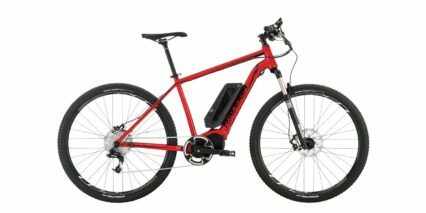 When I was finishing my ride I was going up the hill, one time I was doing this the battery light was red the second time it was yellow. 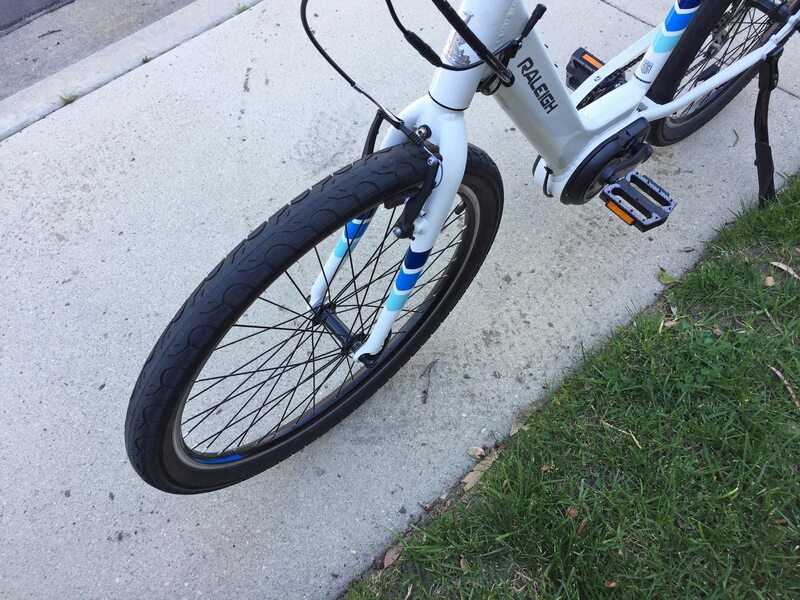 In both occasions the bike had a “dampening” effect or felt like a brake was being applied. Both times I was in full assist mode (4). Curious if you have come across this? Hey, Took bike out again, hubby and I discussed the problem. He thinking I was pushing the bike too hard. 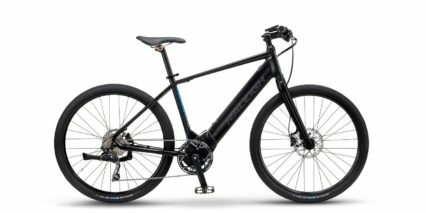 I was going around 18 – 21 mph on the bike, Today rode the bike on trails with people and mixed terrain, bike worked beautifully. Also, when on these trails I did not go above pedal assist 3, just too many folks around and I would be traveling too fast to do corners, etc. 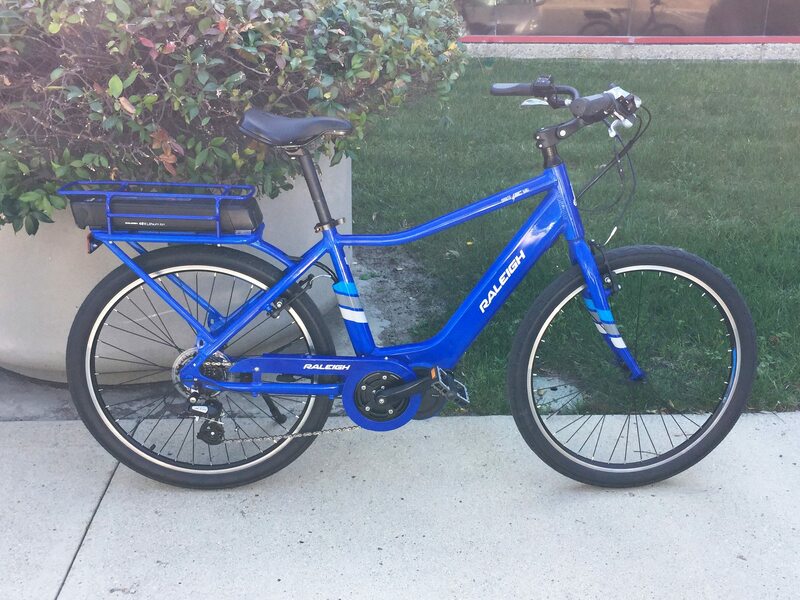 It is a great bike and I am really enjoying myself on it. 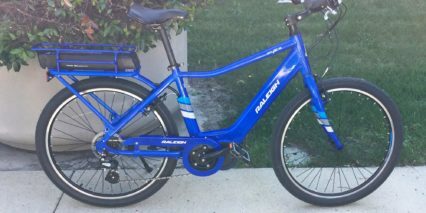 Hi Court, your reviews of the Raleigh Sprite IE bike are excellent and the reviews answered several questions I had about the bike. 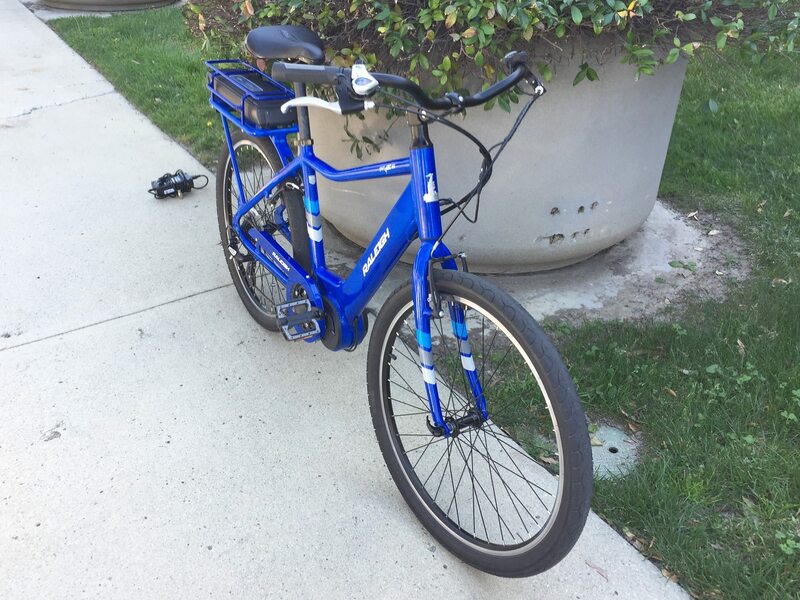 This Raleigh Sprite IE bike is the first Ebike for me (purchaced a couple of weeks ago) and I am having a lot of fun with it riding around the neighborhood of Peabody in Massachusetts… It’s getting cold here now and I envy the California weather that I see in your videos. 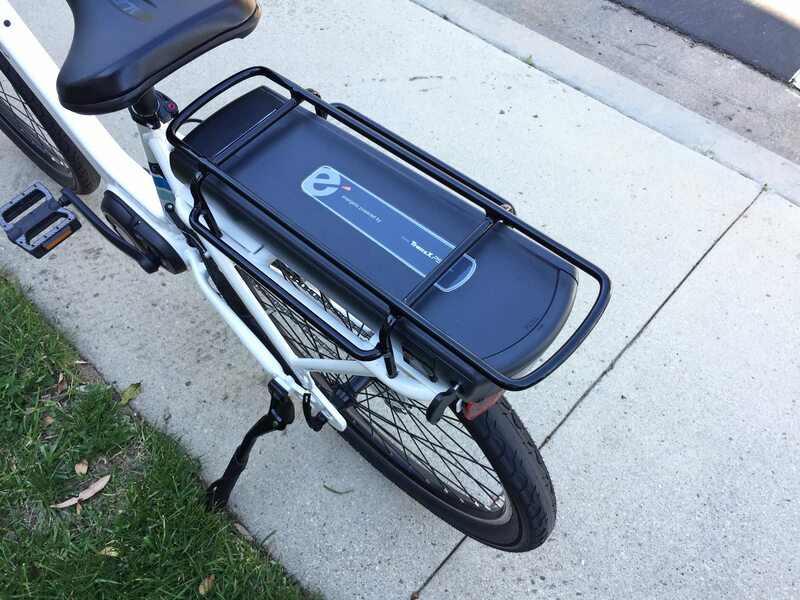 Perfect for bikes. 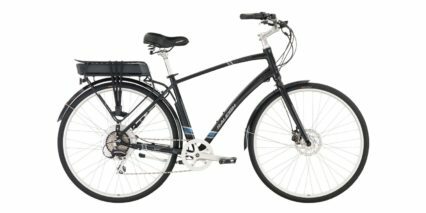 I am semi-retired, but not from biking! 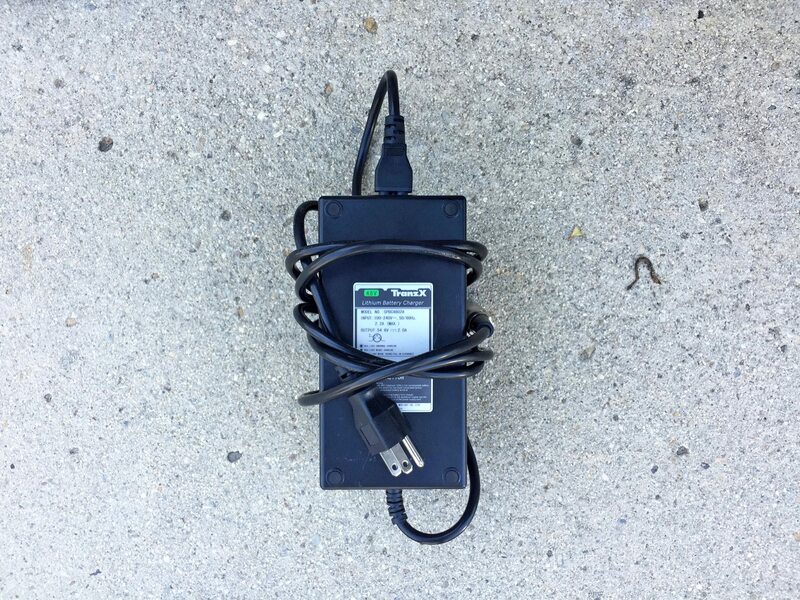 One question I have… I was charging the battery and after a couple of hours, the charger was hot (not super hot) but enough to tell me to take off the charger… The battery was just slightly warm… I know that charging generates heat, but is this expected (more than warm)? 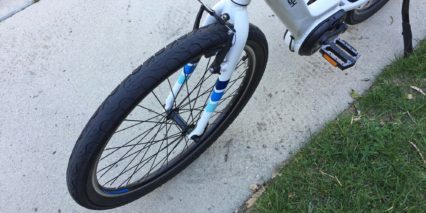 Also, I lowered the pressure in the tires to 40 PSI, for a better ride, will this harm the tires?